--Wonderland has local band Funk DC tonight, DC Jim tomorrow, and Jantz and Friends playing on Sunday. --It's going to be nice out! Go outside and play! As some of you have noticed, the NextBus site I mentioned yesterday is broken. It turns out the site was a test site - Sommer from DCist emailed WMATA, who said it was just a test and it'll be a few months before it's ready, and the NextBus staffer who posted the comment about it asked for me to take his comment off. I don't know if the data itself is wrong, or if it's just the site, but in any cause it looks like we'll just have to wait for the site to be finished. That stinks, but at least we know it looks pretty useful. This is pretty funny - a video of people playing binocular soccer at the Tubman school field. They're wearing binoculars so they lose all depth perception and hilarity ensues. I'm guessing it was inspired by this Japanese game show (hosted by the guy who also hosts Most Extreme Elimination Challenge). Tired of missing the bus or watching it go past when you're still a block away? I sure am. It looks like there may be a solution - Nextbus has a website for WMATA which has a scheduler and a cool live map function, pictured here. However, it seems like a beta version, as you can't get there from the main Nextbus page, and it's not listed on the WMATA website (their site says it's offline). But if you go to the link above, it works. I haven't checked the accuracy of the site yet, but it looks cool - you can pick a line, pick where you are and where you're going, then see when the next three buses show up. Once you're at that page, you can click "Live Map" to see where the buses actually are, both northbound and southbound, and it updates as they move - here's the direct link. You can also add more routes (for example, the 52, 53 & 54) - click "Routes" and add the ones you want. (The Google Map option seems to be broken.) If you put your mouse over a stop, it will show you what lines service it and when the next three buses for each line will come. This is potentially really awesome, so I'll let you know if it works on my trip home today. I was talking to some buddies the other day about this - there really isn't any barber shop (or even fancy salon) in the neighborhood that I know of. There's a few on U Street, like Bang, but that can be pricey, and same with Trim in Adams Morgan. 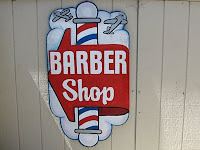 It'd be nice to get a decent haircut for $15 or in the hood - otherwise I have to go to the Wisconsin Unisex Barbershop over in Georgetown, which is a hike. Or does anybody have any recommendations in the neighborhood? 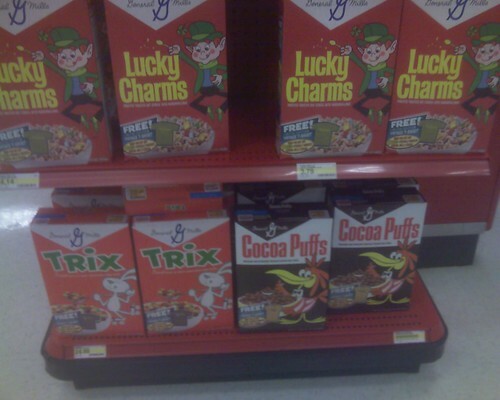 Just saw this the other day at Target, they have cereal with the old school boxes - pretty cool. The City Paper has their annual Best of DC poll out, and you can vote for local spots. It looks like it's mostly write-in, though I did get a link for Pete's Apizza. I can think of a few - best neighborhood bar for Wonderland or Red Derby, best coffee shop for Columbia Heights Coffee or Sticky Fingers, etc etc. Any other local spots you voted for? Looks like the folks at the Answer Coalition are back to postering - I've seen these all over the neighborhood, on light posts, utility boxes, etc etc. Kind of annoying to see them everywhere, especially when the city has to spend money to get them removed and the posters stay up for months after the event. 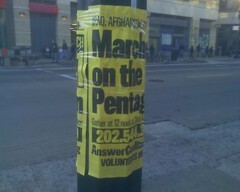 In fact, Answer was threatened with fines of thousands of dollars last year and some members were arrested for postering. Whether or not you agree with the march's goal (which, according to the sign is "Iraq, Afghanistan, Palestine"), I don't appreciate the neighborhood being covered in posters. This is short notice (my fault) but it's cool! a) Believe in free writing programs for children in DC? b) Wish you had a reason to grow a Fu Manchu? c) Have a man crush on Chester A. Arthur, Tom Selleck or Rollie Fingers? If so, you have a place with the Capitol Letters Mustache-a-Thon. You can help us raise money in the month of March by trying to put your facial follicles to good use. Participants will get a free, clean shave and chart their hair-progress at our weekly happy hours. The Mustache-a-Thon runs from February 28 to March 31. You and your fellow group of fearless men will gather financial support from family, friends, co-workers and 'stache fans all to benefit the free programming of Capitol Letters Writing Center. They can sponsor you for the month, the week, or in one big lump sum (We are partial to big sums of money). We challenge each of you to raise $137.23. Ladies, we haven't forgotten about you. We will have weekly challenges for our prosthetic moustache harvesters. We also challenge you to raise $137.23. Follicle famers will weigh-in each week at Asylum (2471 18th St. NW) and win stache prizes. You will also be able to track and post your progress on our blog: http://www.capitolletters.org/moustacheathon/. Never fear! We won't send you out on the streets with only the budding hair on your upper lip. You'll be armed with: donation sheets; postcards about Capitol Letters and the Mustache-a-Thon; answers to FAQs; and a brightly colored button that boldly states, "Ask me about my mustache." If you would like to stache it, let us know by February 18: moustache@capitolletters.org. Do it for the kids. Seriously. Singer-songwriter and Columbia Heights resident Tom Goss sent me this, it's a video for his song "Till the End," featuring a bunch of real couples. Enjoy, and have a good Valentine's Day, whether you celebrate it or not. NATIONAL WEATHER SERVICE HAS ISSUED A FIRE WEATHER WATCH FOR THE DISTRICT OF COLUMBIA FROM 10 AM EST THIS MORNING THROUGH THIS EVENING. A FIRE WEATHER WATCH MEANS THAT CRITICAL FIRE WEATHER CONDITIONS ARE FORECAST TO OCCUR. So I guess watch out for forest fires in Meridian Hill Park, and don't burn your leaves in your front lawn, or something. Just saw this on the DCist listserve (post forthcoming), each Metro line has its own Twitter feed, so you can see how the Yellow and Green (and the rest) are doing. If you aren't familiar with Twitter, it's a little micro-blogging site where you can keep your status updated and keep in touch with your friends or people who write about things you're interested in. It's also good for seeing where people are in the evenings and on weekends - bars, etc. You can Twitter and receive Twitters from your phone and Blackberry too. The other day I noticed some flyers on lamp posts for the new curry place opening on Georgia Ave, which I wrote about briefly before. The place is called Hadiyah's Cafe, and will be serving various curries (the flyer noted chicken) and other Middle Eastern type dishes. It's only been open a few days, and my buddy walked by on Monday and said it closes early, around 7 pm -- that could just be a trial run or something though. Anybody tried it? I want to head by there soon, and also hit Morgan's Seafood, which I've heard good things about. A reader writes in noting that he's noticed a lot of car break-ins and car window smashing lately on Holmead Place and Perry Place. He says he was a victim as well, and suggests that people be extra vigilant: "I myself was victimized on Perry Friday night and this morning several vehicles on Holmead had been broken into/vandalized (window smashing)." Also, make sure you call the police if you notice this, as the more calls the police get to one area, the more they'll focus on that area. --President Obama chose a Columbia Heights religious leader to be part of his the Council on Faith-based and Neighborhood Partnerships. --The city is starting a Call 911 drive for Hispanic immigrants so they aren't afraid to call police, which is thought to be what happened with Jose Sanchez. Good to see. A week or so ago, I posted about how vandals came into our front yard and stole our Gargoyles. It looks like they pried them off in one piece, so I expect they are somewhere nearby or have been resold. They're pretty unique, and I have been trying to find a photo them. But it looks like we didn't take any photos, so let me describe them: they are stone, about two feet tall (maybe less) and a a foot and a half deep. 8 inches or so wide. Painted brown, with some orange and a few other colors. They're a bit weird: they look like a gothic cat with small wings and a snake like tail, with they're tongues sticking out. 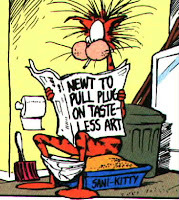 Sort of like a medieval Bill the Cat from the old Opus comic strip. They are pretty heavy, and they were stolen from around the 13th st and Kenyon intersection (near Tubman school). If anyone sees anything resembling them in someone's yard, or in an alley, or perhaps just wants to return them (no questions asked), I would really appreciate finding out. Please email me. Thanks, in advance, for any and all help. If you see them, you can contact him via the Yahoo group post, or let me know and I'll give him a buzz. Today on the way to the bus stop, an MPD officer stopped me and asked if she could ask some questions. Thankfully it wasn't related to some crime -- she was conducting a survey on MPD's activities in the neighborhood, and asked me where I lived (which happened to be in her beat), how visible I thought MPD was, how they had done at preventing crime, and how I thought they were doing overall. I answered "sort of visible," "could be better" and "pretty good." Good to see them out on the street asking people in the neighborhood their opinions. Anyone else get surveyed? The President was in our backyard - he and Michelle visited the Capital City Public Charter School at 15th and Irving on Tuesday and read to some kids there. Pretty cool. The school has it on their website also and there's also a photo gallery. Obama also visited the Washington Sports Club a few months ago. I wonder what's next? Wonderland? Sticky Fingers? Shopping at Target? I just saw that there was a vigil held today at 12:15 pm for Jose Sanchez, the man who died on 14th Street after passersby walked past him and didn't call 911. Did anyone go? What happened? Marc Fisher writes an article about the case of the injured man on the sidewalk who pedestrians walked by. According to Fisher, 166 people walked by, no one called 911, and the man later died. I understand some of the explanations (maybe he was just drunk, and people are worried about police asking about immigration status) but still, it's crazy. Fisher also notes that the police have sometimes chastised shopkeepers who call for wasting their time, which is ridiculous. It's an interesting column and worth a read, and it speaks to other issues - vagrancy in the area, police attitudes, etc etc. Know of any endangered historic buildings in the neighborhood? If so, let the DC Preservation League know! They're requesting nominations for their annual Most Endangered Places in Washington list, which "can include buildings, parks or other landscaped areas, or even vistas and other aspects of the city's unique planned history." The deadline for postmarked submissions in this Friday the 6th, so let them know soon. You can get forms on their website. There's a North Columbia Heights Civic Association meeting tonight with a couple interesting speakers - Clark Ray of the city's Department of Parks and Rec with an update on the park at 11th and Monroe, and Scott Hammons, who is opening a restaurant at 14th and Meridian, which will be called Social. I wrote about the restaurant a couple months ago. The email from the group says the restaurant is schedule for a Spring opening. The meeting is at 7:00 P.M. at the Park Triangle Community Center, which is inside the Park Triangle apartments on Kenyon between 13th and 14th. Enter through the Kenyon Street side, a doorman will let you in. I found this post on Urban Turf, which links to the Prince of Petworth original - apparently there are some discussions to rename the area north of the Tivoli theater "Tivoli North." Really? Is that necessary? It's Columbia Heights. Most of the PoP comments say something similar to "I consider that part of Columbia Heights. Why the need to differentiate?" Why indeed? The PoP post doesn't say who is having these discussions, but when I emailed him, he said it wouldn't be an official city designation. Maybe it's a neighborhood association or realtors who are afraid of some stigma attached to Columbia Heights. Or maybe there's a new blogger coming to the block, who knows. D.C. is a weird beast when it comes to neighborhood names. Some potentially useful ones like Pleasant Plains get discarded, while others like NoMa get invented, even when there already was a name for that area (Swampoodle, which I'd say is much better). I for one don't see the need for this neighborhood irredentism. It's got a name already, why divide it up into smaller and smaller chunks? What's next? "Where do you live?" "I live in Kenyon Street Heights. I live in Wonderland Park. I live in El Rinconcito II Highlands." Looks the auction of abandoned houses I mentioned earlier went well - there's a lot of articles about the houses getting rented and the city making $5 million on it. The Post reports that 304 13th Street NW went for over $200,000, but there is no 304 13th Street NW - I think this is supposed to be 3004 13th Street NW, which is pictured here. Glad to see that house got sold, and I hope it gets fixed up soon. "These are neighborhood nuisances and they've been the site of numerous problems. 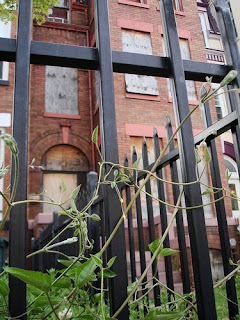 What councilmember, what citizen activist, what great media person hasn't heard the tales of nuisance properties like one behind me [at 3004 13th Street, NW] causing problems with everything from rodent infestation to plain old visual blight?"